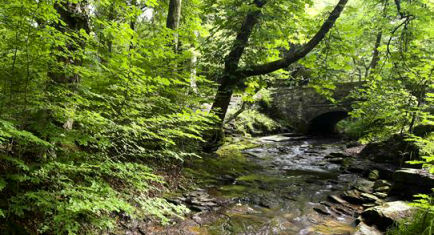 Sunnyhurst Wood, located at Darwen in Lancashire, is a winner of the prestigious Green Flag Award. The 85 acre wooded valley which makes a superb location for walks and picnics. The woods were originally owned by the Brock-Hollinshead family who used them for stag hunting. The area was later sold off to Eccles Shorrock. Sunnyhurst Wood was opened to the public on 2 July 1903 to commemorate the accession and coronation of King Edward VII. The wood was declared a Local Nature Reserve in 2005. Paths meander up the steeped sided valley beside Sunnyhurst Brook, passing the paddling pool, over ornate bridges and up to Earnsdale reservoir, onto Darwen moor, Jubilee tower and beyond. The two ornamental bridges on the lake and the characterful bandstand with its shingle roof, form part of a number of attractions at the wood, often provided by local benefactors. There are also a series of wooden animal sculptures depicting animals native to the woods which are placed along the two mile long Herbert Parkinson nature trail. The sculptures were carved by Geoff Whitley and include a frog, a heron and a squirrel. A wealth of wildlife inhabits the wood, both woodland birds and plant life can be found in the abundance. Some 702 species of plant, birds, invertebrates and mammals have been recorded there. Herons and kingfishers are often sighted at Dingle Lodges and the Moat. The Old Woodkeepers Cottage now serves as a Visitor Centre providing information on walks, wildlife and the local history of the area. Maps of the wood and refreshments are available. The upstairs gallery houses interesting all year round exhibitions by local artists.There is also a children's activity corner and the Young Explorer's quiz. The Visitor Centre is open on Thursday, Friday, Saturday and Sundays (winter times 12noon-3.30pm and Nov-March/Summer April-Oct 1pm-4.30pm). Travel along the A666 to Darwen, the main entrance to Sunnyhurst Wood is on Earnsdale Road which is signposted off the A666 (Blackburn to Bolton Road), one mile from jct 4, M65.